For over half of the 20th century, Ludwig and Slingerland were two of the most prominent drum manufacturers in the world. Both companies were based in Chicago but were never on the friendliest of terms. However, the companies’ histories are indelibly connected. William F. Ludwig Sr. was a drummer who began his professional career in 1894 drumming at Electric Park in Chicago. He was earning the princely sum of $12/week (about $300 in today’s currency), which was a pretty good gig for a 15-year-old first generation immigrant. Ludwig’s father was also in the same band. Ludwig continued his professional drumming career in a variety of divergent contexts, from minstrel shows to the Wood Brothers Circus to vaudeville to the Philharmonic Orchestra of Chicago. He even performed with the Chicago Grand Opera Company, among others. During this time, he made a number of astute observations. The two most noteworthy were that the drum pedals of the day didn’t work very well and that he was deeply inspired by the European-made metal snare drum Tom Mills played in John Phillip Sousa’s band. His response to both of these experiences changed percussion history and the course of modern music. To ease his demands while playing "double drums" in 1909 for the Philharmonic Orchestra of Chicago, he modified the not-very-effective pedal design that was being used at the time. "Double drums, the act of one person playing bass and snare parts simultaneously, was novel for the time. It was simply a more cost-effective way for a band or orchestra to employ one less player. News spread quickly that a new pedal had been born, and he was flooded with area players asking him to make them a similar contraption, which led to the beginning of Ludwig & Ludwig. William F. Ludwig Sr. and his brother, Theobald (also a professional drummer), opened up a little drum shop where they began making pedals in their off-time. Business flourished, and they soon embarked on their first all-metal, separate-tension snare drum, patterned after the Tom Mills 6.5x14-inch snare drum. They also began creating a more practical, pedal-tuned timpani (until this time, all pedal-tuned timpani came from Europe). By 1911, the brothers — along with brother-in-law R. C. Danly — were maturing the pathways for drum pedals, timpani, and snare drum evolution. Early on, the company navigated heavy shifts in its trajectory: the sudden death of Theo in 1918, the First World War, the advent of dance bands, and the end of the silent films — a cultural staple that had provided work for many percussionists as their accompaniment created the sound effects and mood enhancements. Ludwig & Ludwig’s sales topped seven figures in 1926, and the factory employed over 300 workers. 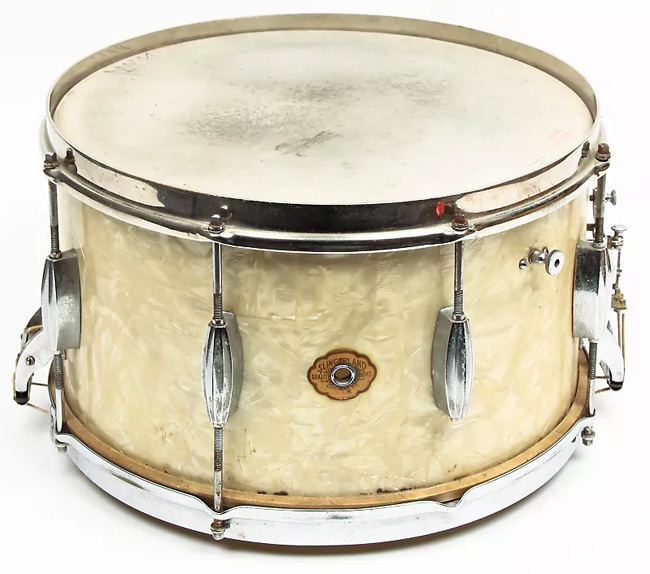 But in 1925, the Ludwigs made a grave error that eventually cost them the company and, interestingly enough, enhanced the life of what was to become their main competitor — the Slingerland Drum Company. In the 1920s, dance bands made extensive use of the banjo. 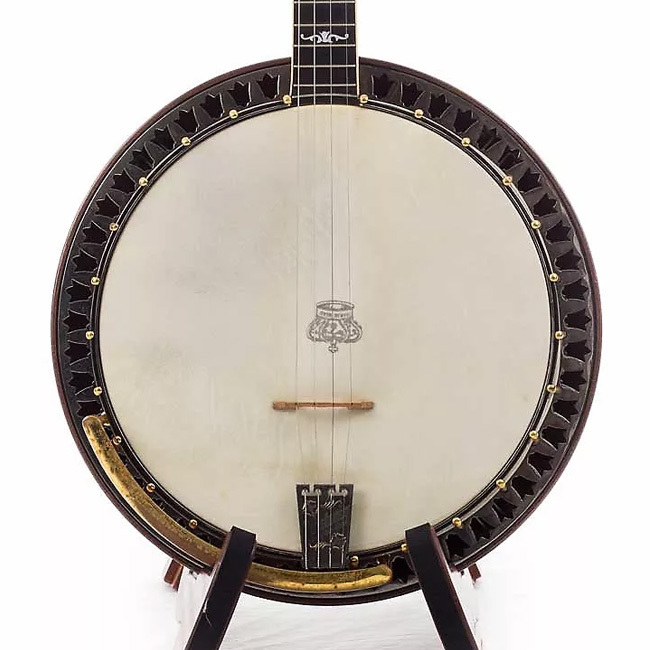 In the strict sense of the word, banjos (along with pianos and guitars) are percussion instruments, so Ludwig & Ludwig invested a great portion of their capital into tooling up for banjo production around 1926. But the banjo was slowly being supplanted by the archtop guitar in most dance orchestras, and everything changed when talking pictures came in. As Wm. F. Ludwig Jr. told me when I did my book on Ludwig (The History of the Ludwig Drum Company, Centerstream Publications, 1991), "That was a big mistake — it was the wrong thing to do at the wrong time and it helped put the company under." In 1929, William F. Ludwig Sr. approached the Conn Company (the maker of band instruments) to determine if they might be interested in buying Ludwig & Ludwig. Though Conn had very recently purchased the Leedy Drum Manufacturing Company, they were still interested and took over Ludwig & Ludwig in 1929, offering the senior Ludwig a position in the drum plant. There was friction there, as Leedy’s former sales manager George Way was the plant manager, and competition arose around which of the two (Ludwig or Leedy) would receive the best promotions and the most engineering attention. Wm. F. Ludwig Sr. resigned from Conn in 1936 and went back to Chicago to start all over again at 1728 N. Damen Ave.
H. H. Slingerland, head of the Slingerland Drum company, had a ukelele business to which he added a banjo line, which then led to the founding of a drum head tannery. These were the days long before synthetic plastic heads were available for banjos and drums. As the ukelele and banjo became less popular, Slingerland was looking for other avenues of expansion. They made their first drums in 1928 — snare and bass drums while tom-toms were still Chinese imports with tacked-on non-tunable heads. They began the manufacture of drums with equipment and machinery purchased at auction from the freshly-failed Liberty Musical Instrument Company. When Ludwig sold to Conn, Slingerland learned that a large portion of the equipment from Ludwig & Ludwig was not going to be taken to the Conn plant in Elkhart, Indiana, as they already had all of the Leedy equipment from the purchase the year before. 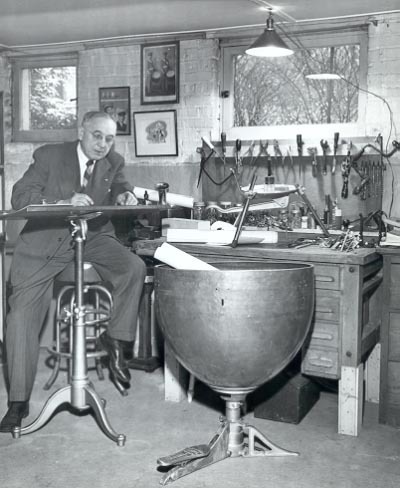 The controller at the Ludwig office in Chicago (Fred Larson) lived on Chicago’s west side (as did H. H. Slingerland), so Slingerland drove Fred to and from work each day. In the natural course of conversation, Slingerland learned that much of Ludwig & Ludwig’s machinery — important pieces, like dies, fixtures, bending machines, and the like — was to be auctioned off from the Ludwig plant, so he dispatched his agent to the auction to buy all of it. At the close of the auction, Slingerland moved everything from the Ludwig & Ludwig plant to the Slingerland plant on Belden Avenue. "The Benny Goodman band was set to play at the Congress Hotel here in Chicago. Columbia Records had sent invitations to the trade, which included my father and myself. We were stunned to see that the drummer was playing alone — the long tom-tom solo on "Sing, Sing, Sing" on the first of the 16-inch toms he got H. H. Slingerland to build for him with tunable heads on both sides, set on a stand. They took that act on the road and it changed everything overnight. The trend became a streamlined set of four drums, cymbals, and a cowbell." Benny Goodman Orchestra - "Sing, Sing, Sing"
With the Krupa endorsement and the Ludwig & Ludwig sale to Conn, Slingerland became the dominant drum manufacturer in Chicago. The senior Ludwig was left to start from scratch with the help of his son, Wm. F. Ludwig Jr. who joined him in 1937, naming the new company the Wm. F. Ludwig Drum Co. — a name which was less than short-lived as Conn legally owned the name "Ludwig." The Ludwigs changed the name of the company to the W.F.L. Drum Company and began forging ahead. This was not an easy time, and their goal became to stay in business for one year. When Jr. went out on the road to sell the new drums, dealers routinely told him that they liked the drums but that everyone wanted "Gene Krupa drums." To offset the difficulties for W.F.L. 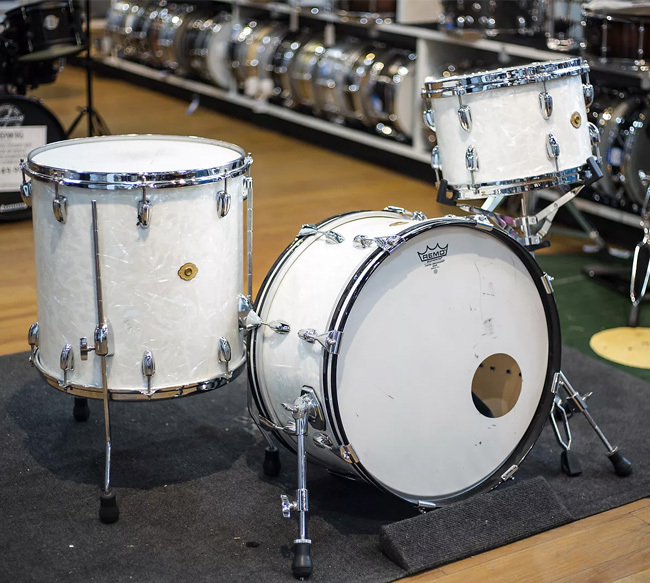 (enhanced by Gene’s endorsement with Slingerland), the Jr. Ludwig crossed the country making sales calls, giving clinics, and began making inroads into the school market, all of which proved fruitful. But when America entered the Second World War, the use of "critical materials" — aluminum, brass, steel, etc. — was sharply curtailed, and all of the drum companies were forced to make do, which they did by producing drums with wooden lugs, few of which have survived. After the war, Jr. was able to secure Buddy Rich as an endorser by "playing" Buddy against Slingerland and Gene Krupa. He told Buddy that with Slingerland, he’d always be second, but at W. F. L., Buddy’d be first. 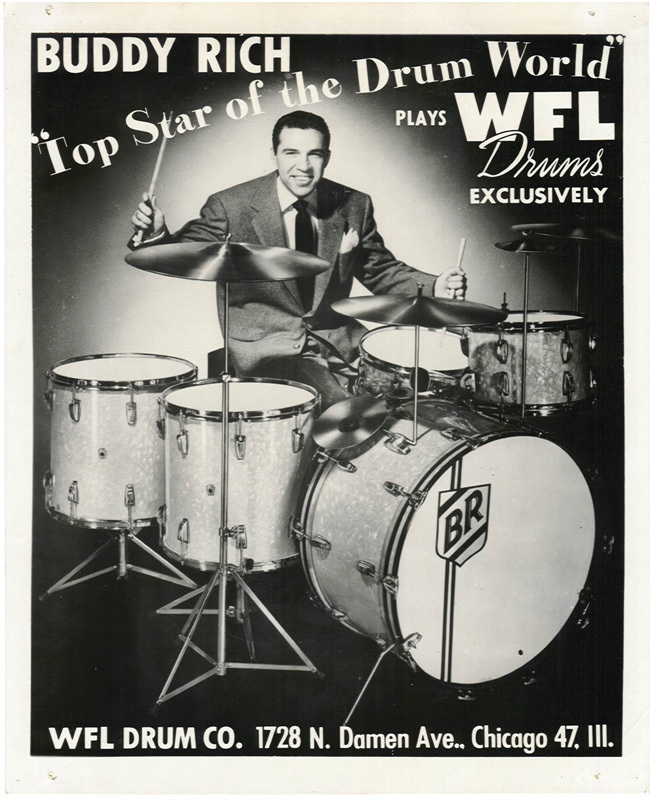 Buddy appeared on the 1947 cover of the W. F. L. Drum Co. catalog, and W. F. L. supplied him with three sets a year and prominent advertising. Sales flourished. Jr. noted that Buddy was very difficult to service and always wished he’d been able to have Gene as an endorser, as Gene’s temperament was much more collegial than Buddy’s. During this same time period, Conn elected to combine their two drum lines, Ludwig & Ludwig and Leedy, into a single line designated Leedy & Ludwig. The line lasted from the late-’40s until the mid-’50s, at which time Conn’s interest in drum manufacturing lost its bloom. Conn produced electronic equipment for the government during the War and was enthused to follow that thread of business at the expense of their drum line. Wm. F. Ludwig Jr. learned of their inclinations and called up "Bud" Slingerland (H. H. Slingerland Jr., who was at the company’s helm at the time) and suggested the two companies make a common bid for Conn’s drum division and split it in half — Slingerland would get the Leedy name/line, and Ludwig would have their name back. This came to fruition in 1955, but not without some animus. Ludwig and Slingerland took four months working three days a week to argue over and divide up the dies and other equipment. Jr. told me that when he asked Bud why he wanted the Leedy line, he said he intended to make the Leedy line in the Slingerland factory as the "second" line, adding, "The way I see it, Slingerland will have the best dealer in town, Leedy will have the second best, and you can have the third dealer in town." The reality was that both companies and the three lines shared the dealers equally, everywhere. In much the same way that Gene Krupa "famoused" Slingerlands in the 1930s, three decades later, a new band from England did the same for Ludwig. 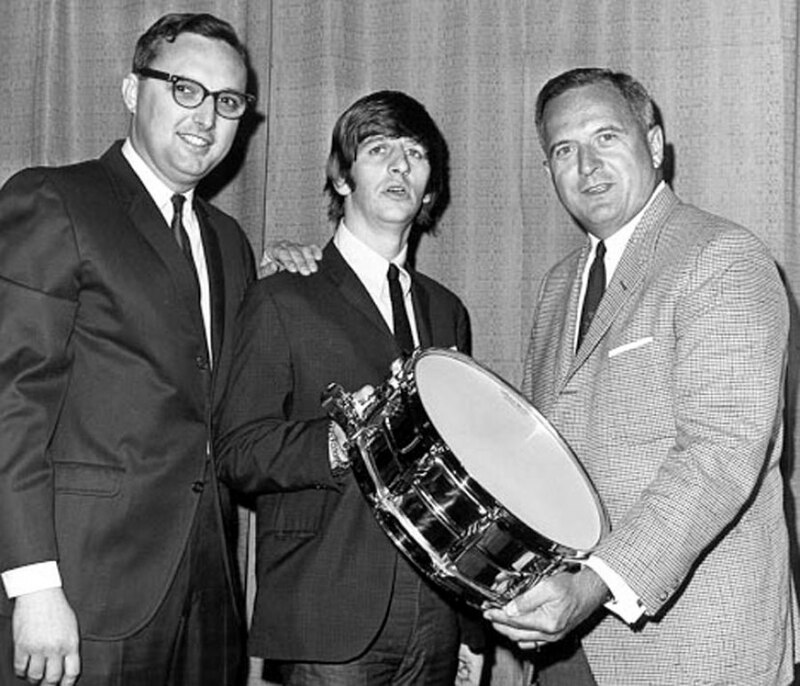 After the Beatles appeared on the Ed Sullivan Show in February of 1964, with Ringo’s bass drum beaming "Ludwig" at the top, sales for Ludwig drums exploded. When I was doing interviews with Jr. for the book in 1985, he showed me around the Ludwig factory at 1728 N. Damen Avenue just as the last of its contents were being moved to North Carolina after the sale to Selmer earlier in the decade. In the nearly-vacant offices, he pointed to what looked like a large, old-school mechanical calculator, which was actually the ticker tape machine that used to take orders when the offices were closed. He recalled how it never really stopped for years. They’d arrive each morning with a roll of orders strewn upon the floor. The tremendous culture-changing character of pop and rock music from the mid-’60s boosted the sales of musical instruments exponentially internationally. The industry referred to it as "The Beatle Boom," and profits were enormous. 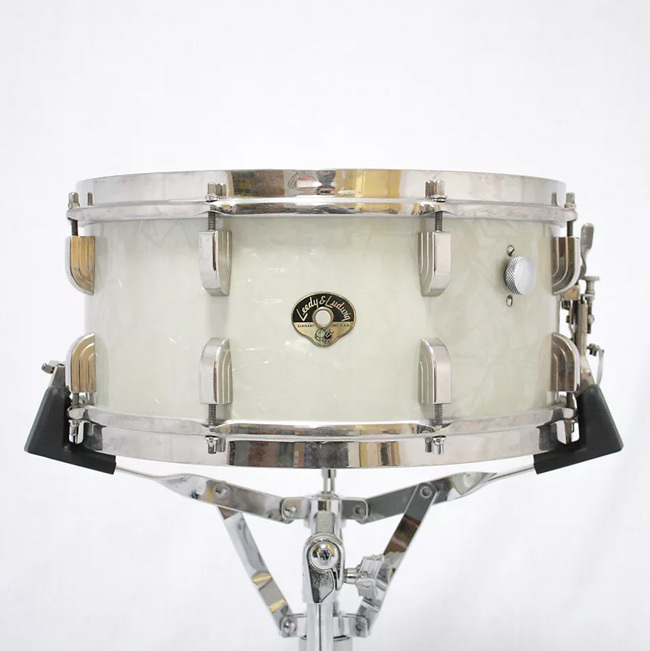 Ludwig retained its prominence during this period, but Slingerland was not lost on its share of noted endorsers, and it rode the coattails of the industry’s explosive popularity, as did all of the major musical instrument manufacturers that produced instruments as those used by the practitioners of the then-new music. The quality of Ludwig drums actually dipped briefly in this period, as they were swamped with orders, struggling to keep up. The painted interiors of Ludwig drums that appeared and lasted until 1968 were to hide the perceived inferiorities of the wood, as they had such a difficult time getting the quality of wood used to in the quantities they required. The feature side to the popularity of drums, guitars, amplifiers, etc. during and after the Beatle Boom was the continued inspiration the music had for the culture. The liability was that the big sales figures drew the attention of large corporations who, in some instances, bought out musical instrument companies and purposely diminished the quality of their manufacture to enhance profits for the investors. Years ago, Roy Burns (Rogers staff artist and co-founder of Aquarian drum heads) told me that after CBS bought Rogers from Henry Grossman, they were at a business meeting where one of the CBS executives said, "If you think we’re here to make drums, you’re wrong. We’re here to make money." This was Roy’s cue to "Exit stage left." Bud Slingerland sold the company in 1970, which ended the Slingerland family’s relationship with drum manufacturing. The company continued to produce drums of excellent quality throughout the decade following the sale, but after that, production undulated between waning and ceasing altogether. In the 1990s, they issued the "Studio King" series that many feel was Slingerland’s best issue. Ludwig sold to Selmer in 1981, but William F. Ludwig Jr. stayed on as a consultant, giving lectures and clinics throughout the country on the role of percussion instruments and effects in the early days of silent films and vaudeville. After the sale in the ‘80s, the drums experienced some periods of uneven quality, but with the seasoned guidance of Jim Catalano (who ran Ludwig for longer than Wm. F. Ludwig Jr. and who wrote weekly correspondence to Mr. Ludwig out of respect and friendship), Ludwig’s earned stature returned. As of this writing, the quality and musicality of Ludwig Drums is exceedingly high. The relationship between Ludwig and Slingerland touches a number of very human realms: "healthy" competition, unforeseeable musical and economic trends, the appeal and effectiveness of endorsements, the value and power of the connectivity of music that stirs people in meaningful ways to such an extent that they’re moved to purchase instruments like those used by the players that bring authenticity and quality to their lives, and how impermanence is furiously reliable. …heads, tuning, and the player’s style has a lot more to do with it than what brand they’re using … tuned up, I don’t think you can really tell them apart." - Wm. F. Ludwig Jr. Different people choose different instruments at different times for different reasons. Ludwig and Slingerland are illustrative of the fact that there’s room for both, as great drummers in all realms of music chose and still choose to express themselves utilizing instruments made by both companies. In the course of my aural history research with Wm. F. Ludwig Jr., he mentioned something interesting to me, especially given the source, " … heads, tuning, and the player’s style has a lot more to do with it than what brand they’re using … tuned up, I don’t think you can really tell them apart." This was partially his way of noting that it’s more about the person and the music than it is about the drum. Candid. Honest. Accurate. All of which were part of his personality that I still miss. Keep playing. The world needs more music. Paul Schmidt (M.M., M. Div.) is an artist, teacher, author, and scholar. His book on Ludwig was the first book ever published devoted exclusively to America’s contributions to percussion instrument development. To learn more about Paul visit his website.